While in Japan, a long-overdue meeting took place: I travelled with Noby to Bandai Namco headquarters, and finally got to sit down and chat with Keita Takahashi, artist, designer, and creator of Katamari Damacy, one of the most innovative and creative video games ever made. Although I'd been working with Takahashi for over a year on the first run of Panic Katamari t-shirts, and felt like I knew him pretty well, we had never met in person — classic Internet style. The main purpose of our meeting? To kick off planning our next round of Katamari Damacy t-shirts. And what an excellent segue for a brief plug! 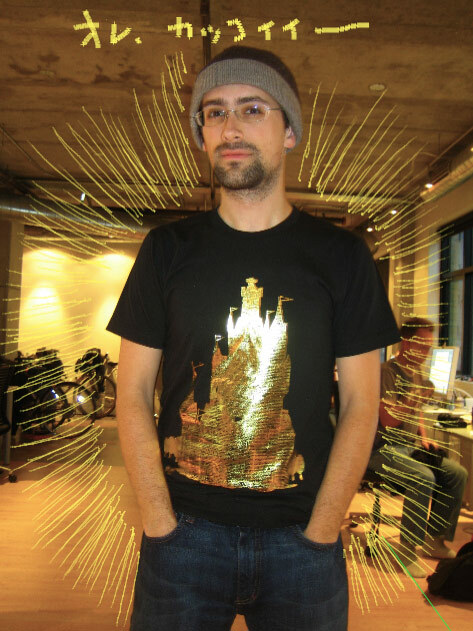 New Katamari Shirts For 2007, Now Available! Hot blog! Hot blog! The new shirts are ready, today! We just posted five incredible new Katamari Damacy t-shirt designs to the Panic Goods store. I think these designs are even more amazing that the first set. We tried to experiment with alternate printing techniques, in addition to ink — we're using gold (and silver) foil, as well as flocked (fuzzy) printing. 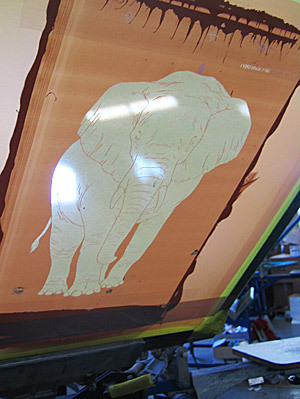 Both techniques are pretty amazing to witness — in the case of foil, a sheet of foil is literally pressed to a screen-printed adhesive, and the excess foil is removed. Flocking is even crazier, with millions of little charged fibers blowing around a chamber and electro statically attaching to a shirt while standing perfectly straight. The end result is all that matters: shiny shirts, fuzzy shirts, awesome shirts. Here's yours truly, shining away. The future is now! The shirts are still a reasonable $24.95, and you can purchase them here! We hope you, the Katamari fan, and even you, the non-Katamari-fan, love these new shirts. We all loved the Katamari game. And we had some t-shirt experience with our MacWorld shirts, and had started selling shirts online. My friend Jason Sturgill off-handidly suggested that we should make Katamari shirts. I half-jokingly suggested it via e-mail to Noby, our guy in Japan. Noby half-seriously looked in the phone book and called Namco Japan and, after a brief discussion, they scheduled a face-to-face licensing meeting that same day. 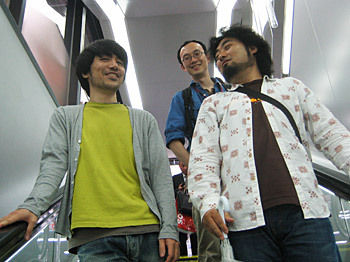 Noby met with Keita Takahashi and Kei Umeki (Namco's licensing guy), and, after talking, permission was granted. That's it. That's how it happened. 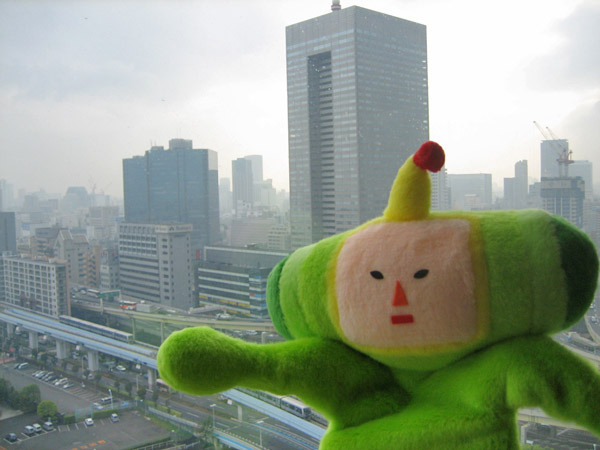 Just like that, we were the first — and, to this day, the only — company to ever get a license to make Katamari Damacy goods. You need to understand that Takahashi, to his infinite credit, is very protective of his creation. At the time we were speaking, Namco had huge success with their Taiko Drum Master series of video and arcade games, and the (very cute) characters and designs for Taiko Drum Master were being merchandised and printed on every possible product imaginable throughout all of Japan. It was a clear and vivid depiction of the extremes of licensing: your characters bordering on generic. I think Takahashi saw this, and felt that the over-commercialization of his game and idea would really dilute the beauty and uniqueness of it. So why did he choose Panic, and not any other, er, "real" company? As Takahashi explained to us, we are primarily a Mac software company — in the t-shirt world, we're outsiders. Takahashi is primarily an artist — in the video game world, he's an outsider. With both of us working outside our expected zone, he hoped it would create the perfect environment of artistic freedom, one in which we would respect his vision and together we would create goods that are both awesome and artistic. Admittedly, when I first started working with him on the shirts, I had in mind some very classic video game shirts. Mind you, I'm not talking about retarded and "hilarious" text-laden Hot Topic video game shirts, all the "DON'T MAKE DONKEY UP IN YOUR KONG" and "MASTER SWORD DOWN BELOW" and all that. No, I imagined Cabel-style shirts, cute depictions of Katamari characters in appealing poses with complimentary colors. Therefore, his first incoming designs took me completely by surprise — they were really different, featured animals, and often didn't feature Katamari characters in prominent positions, if at all. So, Takahashi and I began our famous game of "artistic back and forth", making suggestions and revisions to each others' artwork, each pushing from a different direction. Ultimately, I came to understand and quite respect what Takahashi was trying to do — treat the characters and the world he created as an artistic endeavor, not a necessarily a commercial one. A bold call, and an amusing thing to come to grips with when your goal is to, you know, actually sell t-shirts. But he was right: there was no reason to take the easy way out with this project, and just create what was expected, because, for both of us, this was a fun side project, not our core business. So, what was there to lose? 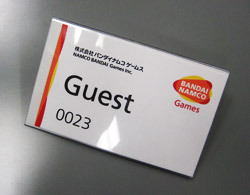 Takahashi, Noby, Umeki and myself met at Namco HQ, and talked a little business. I showed him our new "printed label" shirts, and we talked a bit about the plans for the next round of shirts. We then headed to an indoor mall (almost all of Japan Tokyo is an indoor mall) and got some Chinese food. We had a really nice time talking about consoles, games, systems, Takahashi's work, and the like. When you read translated interviews with Takahashi in the American press, you get the impression that he brashly hates everything. In reality, this is only partially true. He's actually pretty shy person, and you quickly realize it's not "I hate everything", but honest, thoughtful opinion — his vision is so specific, and many things don't live up to his expectations and their potential. What also doesn't come across in the press is his dry sense of humor and mischievousness — his critiques are generally said with a sly smile and a laugh, as if he knows he's being marginally ridiculous by admitting, for example, that he didn't really like Mother 3. That's not to say I have him fully figured out. We know he has a low tolerance for anyone who takes the "safe road". So, you'd think he'd be a huge fan of the convention-shunning Nintendo Wii system, right? Wrong! He's currently playing the GameCube version of Twilight Princess, intentionally avoiding the Wii version! Why? Who knows! The lesson? Takahashi will keep you guessing, but in a good way: you'll be suprised, confused, and delighted, just like when you play his games. Anyway, after lunch we headed to a brand new Yodobashi Camera store, still smelling of fresh paint. It's really not hard to understand why nerds are crazy about Japan: it's everything we love in the world, concentrated into a few small islands, and then whipped up into a rich lather of absurdly beautifully epic proportions, creating things beyond our imaginations. Food? Music? Snacks? Toys? Computers? Games? Comics? Movies? Television? Bigger, crazier, nuttier, better, awesomer. Yodobashi Camera is a perfect demonstration of the magic of Japan, particularly the new stores (like the giant one in Akihabara, and the one we visited), which will liquidate your mind. If you live in the USA, try imagining a Fry's Electronics, except actually good, not all gross, way bigger, and with significantly more real cool stuff. And without 75% of the things having been returned. I didn't Photoshop that. Japan is awesome. I bid goodbyte to Takahashi and Umeki, and we headed back to the trains , but not before learning a little about Takahashi's future plans. First off, more Katamari Damacy games are coming! The games are no longer being worked on by Takahashi ("We Love Katamari", the sequel, was as far as he wanted to take it), but Namco is soldiering on without him, and I'm still very excited about what's to come. Look for some new Katamari titles possibly as soon as later this year. So, Takahashi is now working on something totally new. What is this new video game project? What platform is it on? When can we see it? Sadly, I can't say. But, as with all things Takahashi, it's safe to say you'll be surprised, confused, and delighted. The Prince, waving from our hotel room. What hotel are you staying at, and would you recommend it? Thank you Panic and Namco!! 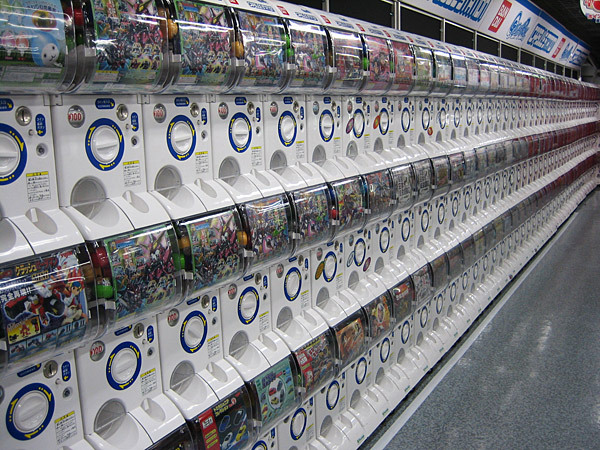 That capsule toy vending machine row is amazing.. unbelievably amazing. Namco's soldering? I thought they just did software! Awesome shirts Cabel! Great story on meeting Keita Takahashi, I cannot wait to see what he does next. Just placed an order for a fuzzy rolling shirt! I thought I was the only one blown away by Japanese vending machines. Wait a minute, I'm confused; you said that Panic is "the only — company to ever get a license to make Katamari Damacy goods." So where'd that plush Prince in the last picture come from? Is it available for purchase somewhere, or is it a unique one-of-a-kind item that was made specifically for Takahashi? Namco makes some stuff themselves for internal / promotional use. They obviously don't have to license Katamari to themselves, since they're the license holder. It's true. That puppet was a special gift from Takahashi. (It actually says 'NOT FOR SALE' on the printed tag.) It's part of the mystical Panic Archive Shelf now! My kids were also _deeply_ impressed by the infinite aisle of capsule machines. As was I. Nice. I bought the Elephant Tee almost a year ago now. I still love it a lot. This time, I think I'm going to buy Monogram (Blue), Rolling, or Castle. Will the new t-shirts be finally available to European buyers? I wanted to get my hands on one for ages. Most of Japan is not an indoor mall; most of Japan is uninhabited. And even the parts that are not at a 45-degree angle are not necessarily indoor malls. They happen to have a very healthy agriculture industry and some really beautiful, wide-open spaces. And do you want to know why the stores aren't full of returned goods? Because the stores don't take returns. Your marginally better-looking store costs us residents untold thousands in items we aren't allowed to demo at the store and aren't allowed to return if they aren't what we expected. The stores are pretty because there are almost no consumer rights in Japan. Even in the case of actually defective merchandise, it can be a bit of an ordeal. Yeah, I've seen rows of capsule vending machines like that before. In Tokyo. Only in Tokyo. What you've said here is akin to someone who visits LA and goes "OMG, in America there is movie stuff EVERYWHERE! They have, like, whole STREETS full of handprints and stuff of stars even from WAY back! America is AWESOME!!!" Try leaving Tokyo next time so you don't make all these ridiculous generalizations that pop up EVERY FLIPPIN' TIME someone writes about Japan. What's the big deal, you may ask? Well, if you ask that, THAT'S the big deal. Japan is just a country. People live here. And finally, just my $0.02 to the American geek contingent (of which I am an unabashed member): Stop cozying up to otaku. They really are as seedy, creepy, and troubled as most Japanese think. It's not like in the US where anime (for example) is kinda a cool avant-garde thing that college kids write term papers about; it's a creepy obsession that hints at very dark and troubling problems in Japanese society. Not that you care; you just like the blinking lights. Thanks. I'll come to you next time I need to know something about Japan from an expert. Anonymous: Sure — I was a tourist on a two week trip, so you're right, it's going to be very challenging to process much more than just the fun and impressive and unique superficials. Still, I'll correct my dumb (and sarcastic) joke: it's Tokyo that's mostly an indoor mall. :) Thanks for the interesting info! "I had in mind some very classic video game shirts. Mind you, I'm not talking about retarded and "hilarious" text-laden Hot Topic video game shirts, all the "DON'T MAKE DONKEY UP IN YOUR KONG" and "MASTER SWORD DOWN BELOW" and all that." Thank you! My sentiments exactly! I am sick and tired of all these joke T-shirts. I find graphic T-shirts without words more appealing than stupid one-liner shirts. Anyway, keep up the good work with the T-shirts and the Mac software! I LOVE the detail of the reversible address info on the postcard that comes with each shirt. Thanks Cabel. Hopefully the next one I get won't end up squashed in the mail! Those are some nice shirts! The Castle is the coolest, together with those heads, but I don't understand why anyone would want a shirt that says: "Video Game", and nothing else (except for the fact that it's shiny!). And I think you should make some shirts for ladies too. Though they have beautiful dresses and skirts to walk around in, so you might say men finally have equally supercool clothing. Ooh, I understand now. It's composed of little heads of the Prince. Although the tone might have been overly aggressive, I'm afraid I have to double most of what the longish post from Anonymous was saying concerning misconceptions about Japan. I've been living in Japan for 10 years now, and there are just too many prejudices (overly positive ones as well as overly negative ones) about Japan. I can't blame people not living in Japan for not knowing this, but also I think it's always a good idea not to assume that, once you've seen one of the biggest cities of a country that it is in any way representative for the whole country. Best analogy: go to Berlin. It's about the most ungerman city in the whole country, and it's the friggin capital. Same about Tokyo, it's still Japanese enough to feel very foreign to us gaijin, but it's about the least Japanese cities in the country.